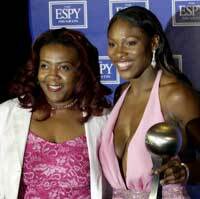 The eldest sister of tennis stars Venus and Serena Williams was shot dead early on Sunday in a confrontation outside an abandoned house in a poor area of Los Angeles where her family once lived, police said. Yetunde Price (31) was shot about 12:15 a.m. in Compton, a modest, tree-lined community about 32km south of Los Angeles, LA Sheriff's Deputy Alba Yates said. The suspected murder occurred outside a single-family home that witnesses described as abandoned, after a confrontation between neighbourhood residents and Price, who was riding in a white sports utility vehicle with an unidentified man, Yates said adding the latter was not injured and was being held for questioning. It was unclear who had been driving the vehicle, they said. Sheriff's deputies and a gang squad from the Compton police department had initially surrounded the abandoned house where it was believed between one and three suspects were barricaded, police said. But police later determined that the suspects had fled prior to their arrival, Sheriff's deputy Richard Pena said. Drug, gang and homicide detectives remained in the area and continued to investigate, he said. Police were questioning several witnesses, but no arrests had been reported. Price died of gunshot wounds to her upper torso a short time after arriving at a local hospital, Yates said. She owned a beauty salon in Los Angeles, worked as a personal assistant to her two sisters, and was mother of three children, Williams' family attorney Keven Davis told Reuters. "Obviously all in the family are very devastated and shocked by this news," Davis said, adding that family members were on their way to Los Angeles. Family spokeswoman Raymone Bain told Reuters that Price's tennis pro sisters had been out of town when they heard the news. "Venus was on the East (US) Coast and Serena was in Toronto filming a movie," she said. Compton is a crime-plagued and poverty-ridden community that has a murder rate four times the national average. Investigators were trying to determine why Price and her companion were in the neighbourhood, a moderate- and low-income area with primarily Latino and black residents. Many homes have bars on their windows. Price was not a resident of Compton but lived in Corona, some 34km to the east. Witnesses on the scene said they considered the area generally safe, but they noted a recent spurt in local shootings. A resident Mark Adams (44) said he was watching TV when he heard 'a lot of shots' possibly from a semiautomatic weapon ring out early Sunday morning. "I could hear it take off," he said, referring to the SUV. "I couldn't hear rubber burning but you knew somebody was trying to get the hell out of there." Venus Williams (23) and Serena Williams, who will turn 22 on September 26, are the youngest of five daughters of Richard and Oracene Williams, who are divorced. The other sisters are Isha, who is a lawyer and singer, and Lyndrea, an actress, singer and stylist. The family spent their early years in the Compton area but later moved to Florida where the two tennis champions attended a training camp for the most promising young players. Serena Williams is the No 3 female tennis player in the world. Venus, the No 6 female tennis player in the world, is the winner of two Wimbledon and two US Open singles titles.